Timma is one of the remote and underdeveloped VDC of Bhojpur district. Timma is second largest VDC in Bhojpur. Pikhuwa Khola (stream) is famous for fishing and swimming in Bhojpur, its fountain lies in Timma. Timma is free of load shedding, hydropower is generated by Shawa Khola. The highest peak in Timma is Maiyung, it is 3333m above sea level. It is famous for tourism area in Bhojpur, Nepal. We can see the panoramic view of Himalayans as well as the mountain from this peak, around the Maiyung there are greenery jungle, herbs, flowers, rocks, meadow, animals (Chauri Gai, Yak)etc. According to the lecturer Mr Kamaljung Rai, Maiyung name remained in Bantawa Language, Maiyung means in Bantawa Mang and Yung; Mang=ancestors and Yung=inhabitant that means an inhabitant of ancestors. Many people come to visit Maiyung from different places, when they reach there they become spellbound by the captivating beauty of Maiyung. Visitors feel amazed and feel relief/respite from their hectic lives somehow. 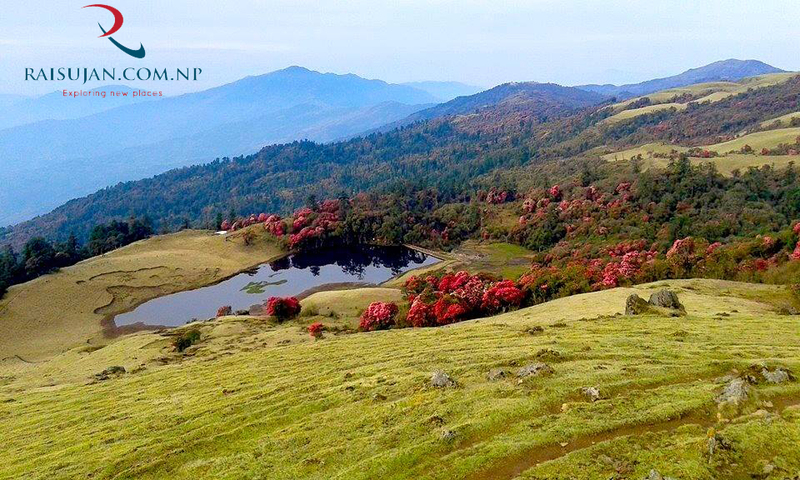 There is also another amazing place near Maiyung hill that is Hass Pokhari (pond). According to the forefathers, Hass Pokhari 's name remained 'Hass Pokhari' because of its shape, which is same like Hass, i.e Raja Hass (swan) come in this pond then swim over the pond. Its main feature is where the water fountain is and where it goes, we have not seen yet. Many visitors visit this pond in the seasonal festival as well other occasions too. In the Maiyung peak, Mela carnival starts once a year, at that time, many people gather there and dance with each other regarding their own cultural background. They meet their relatives, friends and neighbour, then they share feelings and emotion with each other. In this carnival (Mela) mostly beneficiaries are from Khotang and Bhojpur's some VDC. Many types of flowers can be found here most of that Shamphul (a type of flower) is very famous in this Maiyung hill. The main source of income in Timma are Cardamom, Orange, Ghee, Churpi, Rudraksha etc. Timma is surrounded by dense jungle and stream (Khola). Where different caste or kinds of people live here, such as Rai, Tamang, Sherpa, Chettri, Gurung, Blacksmith etc. Most appropriate time to visit this area is Chaitra, Baishak and Jesth but you may visit any month. Maiyung is a naturally beautiful place in Nepal. So, don’t forget to visit once not enough.